Most people have heard of the duel between Alexander Hamilton and Aaron Burr. I don’t know many more duels that have as high a profile as that one – the former Secretary of the Treasury (and Washington’s right-hand man) versus the Vice President of the United States. But duels between high-ranking members of society, and duels among military men, were not uncommon. More than one such duel happened in the midst of the Revolutionary War. In this example we have the highest office-holder in the State of Georgia and a Brigadier General in the Continental Army squaring off. Button Gwinnett was born in England in 1732. There he became a merchant. He emigrated to Charleston, South Carolina, in the year 1770. Within a couple of years, Gwinnett moved to Georgia, where he was swept up among the patriots, and was elected a delegate to the Continental Congress which was meeting in Philadelphia. There, in 1776, he voted for independence from Great Britain, affixing his name to the Declaration of Independence. Gwinnett left Congress in 1777 in order to join the Georgia Convention, where members would write a constitution for that state. He was shortly thereafter voted as President of the Council, which was the highest office in the state. Not simply content with this position, Gwinett attempted to acquire the position of Brigadier General. Lachlan McIntosh was born in 1727 in Scotland, and arrived in the American colonies at the age of eight years. He was active on the patriot side in the years leading up to the Revolutionary War, and he obtained the rank of colonel in time to assist the Americans in repelling the British from Savannah in 1776. His skills and popularity allowed him to defeat Gwinnett and become a brigadier general in the Continental Army. Soon after his defeat, Gwinnett, in an attempt to usurp power from McIntosh, proposed that the Georgia militia attack a British post in eastern Florida. The expedition resulted in defeat for the Georgians, possibly due to a lack of assistance from McIntosh. After an inquiry into the failed attempt exonerated Gwinnett of any misconduct, McIntosh denounced Gwinnett in harsh terms. McIntosh said of Gwinnett, among other things, that he was “a Scoundrell & lying Rascal.” Gwinnett demanded an apology, which was promptly denied to him. Gwinnett challenged McIntosh to a duel. 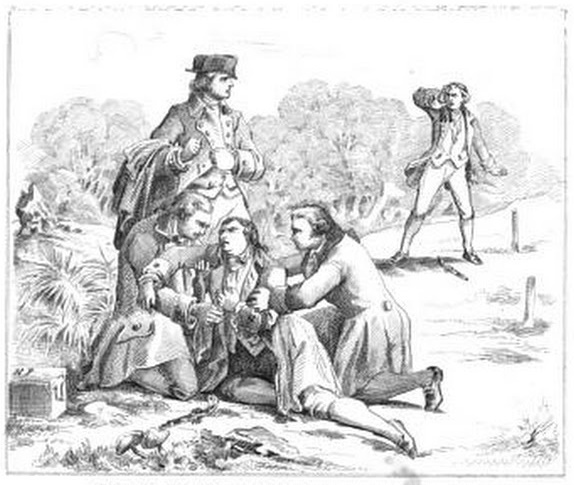 The two combatants met outside of Savannah, Georgia, on land belonging to former royal governor James Wright, on the morning of May 16, 1777. They examined their pistols and took their stands. Gwinnett and McIntosh exchanged fire at close range. Both men were wounded in the thigh. McIntosh asked Gwinnett if he had received his satisfaction, and the men shook hands, ending the duel. Gwinnett’s wound, however, proved to be fatal. He died three days later, and was buried in Colonial Park Cemetery in Savannah. McIntosh survived the duel, as well as the ensuing trial. He was, however, removed from Georgia at the request of George Walton, another Georgia politician and signer of the Declaration of Independence. Walton wrote to George Washington in August 1777 that he was “afraid the friends of the deceased, made sore by the loss of their principal, would again blow up the embers of party & dissention, and disturb the harmony & vigour of the Civil & military authorities.” In consequence, McIntosh spent the winter of 1778 at the Valley Forge camp before leading a successful expedition against the Indians in the Ohio River Valley. McIntosh returned to Georgia in 1779. He participated in the failed defense of Savannah in that year, and was captured in Charleston, South Carolina in 1780. He was relieved of his duty by the Continental Congress, though not dishonorably, and served in that body in 1784. McIntosh died in Savannah in 1806 and is also buried in Colonial Park Cemetery. Lossing, Benjamin J. Lives of the Signers of the Declaration of Independence. Aledo, TX: Wallbuilders, Inc., 1998. (Reprinted from the 1848 original), p. 227-8. Sullivan, Buddy. “Lachlan McIntosh,” New Georgia Encyclopedia. 12 September 2002. <http://www.georgiaencyclopedia.org/nge/Article.jsp?id=h-671&gt; Accessed 6 March 2011. The Papers of George Washington June – August 1777, Revolutionary War Series, Volume 10. ed. Frank E. Grizzard, Jr.. Charlottesville: University of Virginia Press, 2000, p. 514. “Historic Duel Recalled,” New York Times. 10 April 1914. <http://query.nytimes.com/mem/archive-free/pdf?_r=1&res=9F06E1D91E39E633A25753C1A9629C946596D6CF. Accessed 6 March 2011. The Papers of George Washington…, p. 513. Deaton, Stan. “Button Gwinnett,” New Georgia Encyclopedia. 9 February 2009. http://www.georgiaencyclopedia.org/nge/Article.jsp?id=h-2543&hl=y Accessed 6 March 2011. Photo credit: The Book of Signers by William Brotherhead, 1861. page 43. Previous You should play golf.